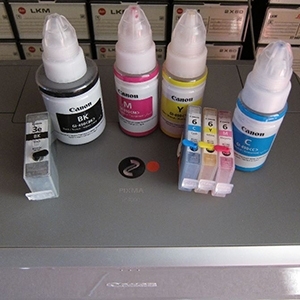 Discussion in 'Canon InkJet Printers' started by stratman, Oct 24, 2018. 50-Sheets Canon Pro Luster Photo Paper (13x19") will be automatically added in cart. you can get delivery to the UK for $5.46 USD with the discounts, as well, can this be true? How did you arrive at this dollar amount? That sounds like more than $5.46 shipping to the UK. It comes up on the page, in the response to your ref. May be it detects a UK user. May be other UK users can confirm. It also blocks my attempts to copy the page, so far. It also blocks my attempts to copy the page, so far. Shift-Print Screen then crop and save in Paint if you use Windows? ...That sounds like more than $5.46 shipping to the UK. Besides shipping you will also have to pay duties and tax, and I also think the mail in rebate is not valid if sent from outside the US. ..... It also blocks my attempts to copy the page, so far. I have also tried the standard tricks with highlighting, copying and inserting in an image handling program and in MS Word. All my attempts were negative. But as suggested by stratman, saving the whole desktop or the active window as a screen shot is a possibility. I use the command key PrintScreen for the whole desktop and Alt+PrintScreen to copy the active window to the clipboard. I then insert the screen shot in the freeware image handling program IrfanView which I prefer over Windows Paint and save the image as a .jpg file after maybe some cropping or other editing. The shipping cost in my previous post is a crop from a whole desktop screen shot, made in this way. There are many ways to create a screen shot, see this. In the end I took a camera shot of the screen and added it as a thumbnail on post #4. What do you make of this? Some time ago I emailed BCH and protested that BCH did not give us as good terms in the UK. They said sorry they could not. But is this a way of getting round the problem? Have I received special treatment? Would I get the discounts? Strange, I don't get a similar offer for shipping to Denmark when entering the site. I've tried visiting the site with Firefox, Google Chrome, Opera and IE. But even with almost free shipping there are still tax and duties to pay, and the rebate is not valid outside the US, this is from the terms and conditions: "Reward Card will only be mailed to a street address (except where prohibited by law) in the 50 United States, the District of Columbia or Puerto Rico." Has anyone taken advantage of these pro100 rebates in the past and gotten their rebate yet?